Living with a greenhouse in your house is hazardous to your health — so hazardous that adults who expose children to such an environment are guilty of child abuse, John Martyny of National Jewish Health and an associate professor for the University of Colorado Denver said Sept. 10. 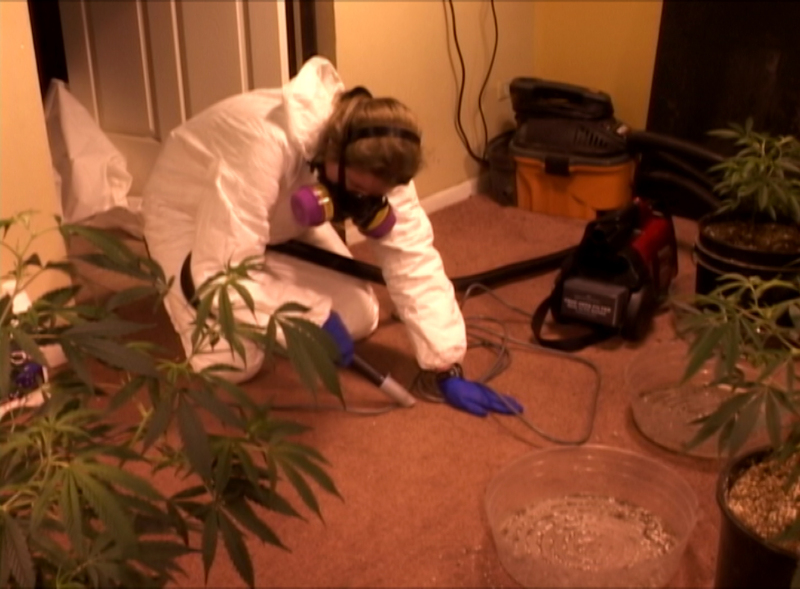 Martyny, working at the request of Colorado law enforcement agencies, led a research team that conducted environmental tests of 30 indoor marijuana grow operations in Denver. Of the grow operations tested, 20 had a “medical marijuana component,” and at least two were supplying medical marijuana dispensaries, authorities said. Researchers found such extreme levels of mold and spores in the homes, commercial offices and warehouses they tested that petri dishes and field-testing equipment “topped out” and couldn’t record the unexpectedly high levels, Martyny said. You can read the study’s findings here. (Martyny’s) research showed that in residential and commercial structures, it was difficult to control chemical contamination from pesticides and fertilizers. The study also showed that plant irrigation resulted in increased moisture that could damage building material, result in excessive mold growth and pose a risk of fire and electrocution. The study shows that highly-elevated airborne levels of mold spores within these structures subjected occupants, emergency personnel and other individuals to significant potential health hazards. Potential health effects include hypersensitivity pneumonitis, allergic rhinitis, asthma and other respiratory diseases. Another concern was elevated carbon dioxide levels which, if generated using fossil fuel combustion, can result in the production of carbon monoxide resulting in significant health effects, or death, to exposed individuals. … others may be impacted as well, particularly in multi-family buildings, which may allow chemicals used and mold spores to be introduced into ventilation systems, exposing other residents. … Since these operations may go undetected, an unsuspecting family buying the residence at a later date may be put at risk of adverse health effects due to residual mold contamination. the difficulties of creating high-potency marijuana outdoors. Martyny cited numerous examples of indoor grow operations where utilities and air vents had been disconnected and/or reconfigured to adjust levels of carbon dioxide to increase the potency of the plants — bolstering assertions from law enforcement officers and medical researchers that much of today’s marijuana — especially once the use of pesticides, fertilizers and other chemicals is factored in — is not natural and contains harmful compounds unknown to users. Martyny’s research is well respected in law enforcement circles. He has studied the environmental impact of illicit substance production — especially marijuana and methamphetamine (so-called “meth labs”) — for law enforcement agencies in Canada and the United States for more than a decade. First responders and officials charged with investigating and removing elements of indoor drug operations have experienced health problems from their exposure — one Colorado law enforcement officer was hospitalized in critical condition because of his work in a marijuana grow house — and also worried about long-term health risks associated with their work. Martyny’s research on indoor marijuana grow operations in Colorado — funded by a Justice Assistance Grant and money from Colorado’s police and sheriffs’ associations — also resulted in recommendations about how law enforcement officials should dress, equip and otherwise protect themselves while working in such environments. These are also the same legalization champions who are running around, telling everyone that if Amendment 64 passes, law enforcement authorities wouldn’t be able to criminalize people for possessing small amounts of the drug and using it at home. They’ll have to devote their law-enforcement resources elsewhere, we’re told. Even if a grow operation isn’t a small amount of marijuana — which it most certainly isn’t — if the drug is legal, you can, indeed, bet that people will absolutely test any and all limits set by municipalities and counties. After all, they currently do — but, with legalization on their side, drug users and addicts will test the regulatory bounds of your county, your city, your neighborhood — and your neighborhood home association — like you have never seen. And you will pay for these legal skirmishes and the increased enforcement. With marijuana legalization chiseled into Colorado’s state constitution, law enforcement agencies will find it far more difficult to address the marijuana-related problems that stand to affect you, your family and your household. And your home’s value? Good luck with that. I too am interested about health effects with residential grow operation. My girl friend here in CA is allowing a guy to have a grow operation in the attached three car garage. The smell is ridiculous inside and out. My girl masks the inside smell with candles. I have heart disease & diabetes and now having headaches and chronic sniffing and chest pain. My question is: can this shorten my life? I believe mold is an issue. First, we are sorry you are experiencing this, and we hope you are receiving good care for you heart disease and diabetes. Please contact us again if you would like information about specialists in your area. We have “soft spots” in our hearts for people with diabetes because of the impact that illness has had on our our loved ones — and, by extension, us. As for your question: We know these indoor grows can lead to mold problems — and no number of scented candles is going to mitigate the negative impact mold can have on a person’s health. We hope you’ll look into having a building inspection service take a look at the property. I have a daughter who is working in the indoor grow operation and she is having a hard time eating and getting stomach issues, We found out she had a seizure last week at home. I have been concerned for sometime now. She was in sales before in the pot store and they gave these “kids” all kids of edibles, CBD oils, and tars to try so they can let people know about the effects to expect…god knows what she has ingested and the long term health effects. She has no insurance where can I turn to in the state of WA? First, we are terribly sorry you are experiencing this, and we, too, are concerned given what you have written. The Substance Abuse and Mental Heatlh Services Administration provides a 24/7 helpline that can connect you to treatment services, regardless of ability to pay for them. The number is 800-662-HELP. If you write back, and let us know what part of Washington in, Dr. T and I are also happy to tap into our personal network to help you identify a local addiction-treatment resource. I live in Ontario, Canada and Marijuana has just become legal to purchase last week in the province. At the moment it can only be ordered from an Ontario Government website: ocs.ca and is delivered exclusively by Canada Post. The Marijuana is delivered to my mail room by postal workers, if the customer is not home when delivery is attempted. The mail room I work in is small (10’x 30′ or 3.048m x 9.144m), and the boxes have been coming in fast and furious for customers to pick up. I have noticed over the past few days, that there is a smell emanating from the boxes – collectively (5.5″x 5.5″x 5.5″ or 16cm x 16cm x 16cm). It is very noticeable and at times overwhelming. I assume the boxes have well sealed packages inside, and the boxes appear well sealed on the outside. Over the past few days, working with and where the small boxes are stored, I felt light headed, irritable and slightly foggy when thinking. My questions are: Are there potentially any health concerns that I or my fellow should be aware of while handling these packages? Is proper ventilation now a concern for our mail room? Such a good question — and one we had never considered. Thank you so much for writing to us because your question is bound to help others who are similarly worried. We’re going to reach out to some Colorado contacts and be in touch. But one thing we can write with certainty: You should push for more room ventilation if you’re experiencing lightheadedness. Please keep us posted about your experiences. Here in Michigan we will be voting on the legalization of recreational use of marijuana next November. Our family had a marijuana grow house next door for a little over a year before the police put them out of business.It was a terrible experience for us. I am trying to put a letter together to send to our politicians about this insane concept of growing pot in residential areas and to not endorse any part of the pot advocate’s concept. would it be permissible to reference your article to these various city-county-state leaders ? Please feel free to cite the information you find on DrThurstone.com to support your efforts to combat marijuana use and marijuana legalization. Thank you for reading. 24-7-365days a year,my heath is failing my home is being ruined,Im not able to think straight cant do much without hacking up out my lungs and that’s indoors,outside its so bad in mins you are sicker then hell.is there anyone to help,people run away when walking into area,the RCMP say they cant do anything about growops even 50to100 plants,the courts will not prosecute.the government gives me the runaround.i don’t want to die an early death from growops some out there should be able to help help help i feel like writeing help an infinet number of times but I’m a little tired been sleeping my life away bloody thanks cruel world!!!!!!!!!!!!!!!!!!! Mr. Antonovicz: Thanks for writing and sharing your experience with us. First and foremost, we are sorry you are experiencing these problems. Have you tried contacting your city’s office of planning, building and zoning enforcement? Officials there may have helpful information and/or be willing to send a code enforcement officer to your property to determine whether follow-up is warranted regarding the marijuana grow operations surrounding your property. grow-ops all around me with 50 to 100 plants makes the air inside my home an outside unbearable outside you choke gag through-up in mins hacking clear flem from lugs inside headaces eyes nose throwt burning iching cant eat much cant sleep well loosing weight cant enjoy life it causes me bad joint an body tissue pain it is slowly sucking the life out of me there is no question if nothing is done soon to stop it I will probably die an early death buying smoking is not the same as living in the toxic discharge coming off big grow-ops I cant function or thinkright. We live in an RV Park at property line next to a Marijuana processing facility, less than 100 feet away. We do not know exactly what operations take place in this building but we are exposed to the strong odor of Pot for many hours of every day and night. Both my wife and I have been experiencing strong sinus type headaches and we are concerned they may be caused by the almost continuous exposure to exhaust chemicals, mold spores, etc. We are both senior citizens. Do you have any advice as to our situation. Is it possible that we are suffering from exposure? How can we have our situation evaluated? Thanks for any help. Mr. Beck: First and foremost, we are very sorry you and your wife are experiencing this, and we want to help connect you with local resources that could take a look at your situation and provide more information. We will send you an e-mail directly to gather some information with hopes of being helpful. I’m very interested in learning more about the relationship between indoor marijuana growth, mold growth, and chronic upper respiratory infections in small children. My grandson visits his grandparents at least every other weekend and they have an indoor grow room in a very small 1 bedroom apartment that my grandson is exposed to from a Friday night until a Sunday afternoon. And then somewhere between Monday and Wednesday after he has returned he ends up at the doctors with either ear infections, or croup, or fevers of unknown origin. I believe that it stems from the grow room, but most people look at me like I am crazy. Please help!!! Thanks for sharing your experience and question with us. You are wise to look into this further. You may find more information from National Jewish Hospital in Denver, which specializes in the treatment of respiratory illness. Many researchers are also very approachable and happy to provide information about their work. This particular study’s co-authors are: Martyny, J.W. ; Van Dyke, M.V. ; Schaeffer, J.; and Serrano, K.
We also recommend that you contact the National Alliance for Drug-Endangered Children: http://www.nationaldec.org/directory/91242/117624. what chemicals are involved in marijuana production. Our neighbor has a larges scale operation in his shop. heat pumps, chemical barrels outside etc…. Our house smells like weed when we leave the windows open. my wife gets headaches from it. She just miscarried. could there be a link? First and foremost, we’re so sorry you and your wife experienced a miscarriage. We also have known that sadness. As for your questions about the chemicals involved in marijuana production: They are good ones, and the answers vary widely from operation to operation. We recommend that you contact the city in which you live — you could start with your local police department or building code enforcement division — to see if someone could visit your property to conduct an inspection that helps determine whether there is reason for follow-up.